President Donald Trump vowed on the campaign trail that he would “stop illegal immigration, deport all criminal aliens, and save American lives,” and on Tuesday his administration tried to offer evidence that he’s making good on his pledge. The Department of Homeland Security announced that illegal border crossings have hit a 45-year low, and that arrests by immigration agents are up 25 percent compared to last year. 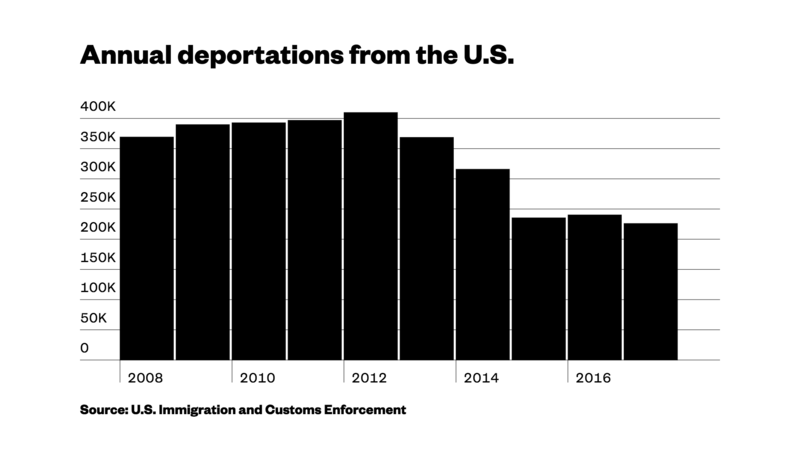 Deportations were down 6 percent overall, but “interior removals” — cases involving people who were not caught at the border — skyrocketed by 37 percent since Trump’s inauguration in January 2016 compared to the same period last year. “We have clearly seen the successful results of the president’s commitment to supporting the frontline officers and agents as they enforce the law and secure our borders,” said Elaine Duke, the acting Homeland Security secretary. But a closer look at the data reveals some alarming trends. Immigration advocates and attorneys say that while the Trump administration has undoubtedly cracked down on immigration, ICE agents are mostly going after soft targets — not hardened criminals. Data released Tuesday by Immigration and Customs Enforcement (ICE) stated that nearly 90 percent of the immigrants who were arrested in the 2017 fiscal year — which started last October and ended Sept. 30, 2017 — had some type of criminal conviction or faced criminal charges. But three of the four most common types of convictions and charges involved traffic offenses or violations of immigration law, not violent crimes. The other most common offense was “dangerous drugs,” but ICE didn’t offer specifics about which drugs were involved and in what quantities. Thomas Homan, the acting director of ICE, told reporters on Tuesday that his agents are merely trying to make the country safer. “We arrested more criminals this year than last year, which kind of takes the wind out of the sales of people who say we don’t prioritize criminals anymore,” he said. But Homan also acknowledged that under Trump, anyone who is in the country without the proper authorization is fair game for arrest and deportation, regardless of the circumstances. The result of that policy is ICE agents rounding up longtime U.S. residents, including the parents of citizens. These arrests have often grabbed headlines because they occurred at or near hospitals, courtrooms, churches, and other public places. Communities that are nowhere near the border — including ones that supported Trump in the 2016 election — have been shocked to find that neighbors, employees, and friends are disappearing due to ICE arrests. Homan insisted Tuesday that ICE has been falsely accused of “conducting indiscriminate raids and sweeps,” and said his agents only conducted “targeted enforcement operations.” “Every person who we arrest, we know exactly who we’re going to arrest and where we’re going to arrest them,” he said. But many have speculated that the decline in apprehensions at the border is linked to fears among Central Americans about being subjected to Trump’s policies. At the same time, the huge rise in “interior removals” is a direction reflection of the Trump administration’s approach to immigration enforcement, said Alina Das, co-director of the Immigrant Rights Clinic at the New York University School of Law.